I finally got my act together and wrote a post in time to link up with Leeann's Man Candy Monday! Ryan Gosling has always been on my Future Husbands list BUT I loved him with Rachel McAdams so he wasn't included in the official list in the past (my list doesn't include those that are married OR with people that I like-how can you break up perfect couples?). Anyway now that he isn't with her he is back on my list! A lot of girls (and guys) like Ryan purely for The Notebook. But I am a bit of a Ryan snob and I get slightly annoyed by these so called fans that have never seen any other Ryan movies (you know you do this with your favorite actors, shows, and sports teams too-everyone jumps on the bandwagon). Obviously the more love the better (HELLO I WANT MORE RYAN MOVIES!) so I'm sort of kidding about my Notebook pet peeve. Lars and the Real Girl was totally underrated and it is such a good movie! It's definitely odd (Ryan's character has a relationship with a doll) but very sweet (the people in the town "accept" the doll) and just an overall feel good movie. If you really feel the Ryan love, checkout Half Nelson and Murder By Numbers. Half Nelson is REALLLLY hard to watch so be warned. Ryan plays a teacher with a drug addiction. The acting is amazing but the movie is sad. Murder By Numbers is another outstanding Ryan performance but do not watch it alone at night! It is scary! Ryan's character is so charming and he has great chemistry with Sandra Bullock. I want to hear your opinion in the comments. YAY or NAY for Ryan Gosling? Do you think he's overrated? Underrated? Just a pretty face? Agree...he's totally my crush too. Hilarious you wrote this...I'm writing a post on him too! haha! He is defiantly my biggest start crush! 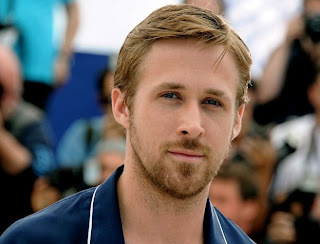 I love Ryan Gosling! Yay defiantly Yay, Even though I have seen two of the other three movies you mentioned I do primarily love him for ''The Notebook''. Celebrity crush alert! Defiantly yay! I'm with you on everyone being all over him for The Notebook but love Half Nelson and Murder by Number!! Another fun fact (and dating myself)he started out ont he show Breaker High...anyway great post for Monday! I totally know how you feel about some of his other "fans" I do that with my favorite band lol. It'd true though what you're saying. And I agree, him and Rachel were way cute together! I think Ryan is hot in action, but not so much in pictures (I say this about like 75% of guys, I'm weird, I know). He's def a great pick! Loved him in The Notebook, just had that "something" on screen. Wondered where and when he would show up again! Definitely easy on the eyes! YAYYYYY!! Just found your blog and I'm SO glad that I did because I've pretty much always been in love with Ryan Gosling. Ever since he was on The Mickey Mouse Club. While he was great in The Notebook, I could only watch that movie ONCE because I cried that much. Half Nelson was a great movie... he did some amazing acting. I'll always love his little part in Remember the Titans because he is just so dang cute!! Murder by Numbers is a good one and so is Fracture!! major YAY! He is definitely on my list of top 5! And I completely agree with you on Lars! My favorite Gosling movie. You know my answer to this... NAY. I just don't get it. I don't find him attractive, and haven't seen anything in his personality or his films that makes me think he's more attractive. I love Ryan! Did you see "Blue Valentine"? Totally not a feel good movie, but Ryan was terrific! I've seen most of his films and honestly, The Notebook is not my favorite Ryan flick. I can't wait to see Crazy Stupid Love plus his flick with Clooney!!! Kaitlyn-did you ever see him on Mickey Mouse Club? Adorable! Leeann-I agree-he doesn't photograph as well. I wish he'd smile more in photos! Oh my god, he was sooooo HOT in Crazy Stupid Love! I've always wanted to see Lars and the Real Girl, but I've never gotten around to renting it. I resolve to do so before the end of summer! love him and I love his other movies too! I can't wait to see Crazy Stupid Love!